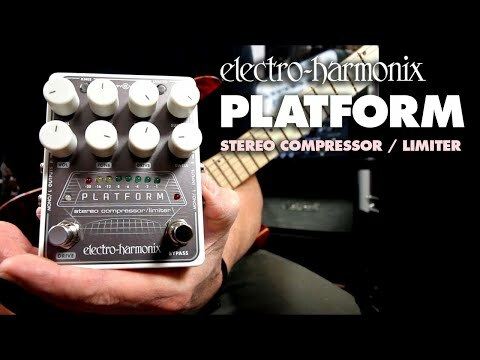 The Electro Harmonix Platform Stereo Compressor Guitar Effects Pedal offers studio-ready compression in a compact pedal that can be taken out of the road. A versatile stereo compressor/limiter at your fingertips can do wonders for your recordings and live sound, and no matter what style of music you play, you'll wonder how you got by without one of these beauties in your setup. Whether you're performing on a guitar, bass, or keyboards, the Platform guarantees precise and powerful control. It's even great for using on vocals! The range of expressive control over your tone truly remarkable thanks to the Platform Stereo Compressor. The control layout includes knobs that cover: Main Volume; Attack; Release; Sustain; Drive Volume; Drive Tone; Drive; and Swell. The Main Volume allows you to control the balance between the level of your bypass (dry) and effect modes. The threshold of the Platform is fixed at a constant -35dB, and this is the level at which the compressor kicks in. The Attack sets the amount of time that passes between the compressor/limiter kicking in. A slow Attack emphasises the initial attack for a defined pop to each note (especially good for funk and country players who want each note or chord to jump out). A fast attack produces an even compression where that initial pop is compressed along with the sustained note. The Release knob controls how long the note tails off once the signal drops below the threshold. The slower the release, the smoother the effect. A fast release setting gives an audible "pumping" effect, which sounds like fluctuating level changes. The Sustain knob determines the ratio of compression once the threshold has been crossed, with a higher ratio resulting in peak-to-peak reduction in your signal for a more consistent output. The Drive knob adjusts the input gain of the overdrive setting, creating anything from a simple boost to a weighty distortion. The Tone knob adjusts the frequency response of the hi-cut filter to tighten your overdrive. The Swell control kicks in each time a new note is played, and is great for creating ethereal soundscapes or weird reverse-tape-like effects. Across the top are two buttons: Knee and Limiter. The Knee button changes the compression/limiting curve to determine how pronounced the compression effect is. When the button is illuminated, a soft knee is in operation (more subtle compression). When it isn't lit, a hard knee is operative (more obvious compression). For guitar, bass, drums, and keys, a hard knee effect makes every note pop out with a nicely boosted effect. With pads, synths, vocals, and strings, a soft knee gives the sound the lift needed without "sounding compressed". When the Limiter is engaged, the compressor retains a virtually infinite ratio, which stretches your sound out as far as possible. The Electro Harmonix Platform Stereo Compressor can be used in either Mono or Stereo modes: Mono In and Out; Mono In and Stereo Out; or Stereo In and Stereo Out. How simple of complex your signal chain may be, the Platform is adaptable enough to suit everyone's needs. The unit comes with an EHX 9.6DC-200BI power supply to get you up and running. As we've come to expect from the team at Electro Harmonix, the Platform is built to a very high standard of quality. All controls and switches respond smoothly and dutifully, with a reassuringly resilient feel.